A typical day. When and what we do. Caspar and Otis both wake (usually one wakes the other) and move into the kitchen to get breakfast ready. This is usually where I find them in the morning. After breakfast it's time to get dressed and take Caspar to school. Once we've dropped Caspar at school Otis and I will go shopping (think fruit and vegetables, butcher etc), meet up with friends or go home. Once a week Otis and I attend a Montessori Parent-Toddler class at the school. At home Otis is free to do as he likes but he usually stays close to me. I go straight into clean up mode. I attend to the dishwasher, laundry, tidying and Otis will often help. This is usually a period of PRACTICAL LIFE. Sometimes Otis will play along side me, I might be in the kitchen and he will get out his play dough at a table near me. If I'm hanging out the washing he might play in the sand pit outside. If I'm sweeping he will sweep too. During this time we will also prepare and eat snack together. Otis and I will also prepare and eat lunch together. Otis is almost at the point of giving up his afternoon nap completely. If he takes a nap it's usually after lunch. If he doesn't nap we still have some quiet time - we will read or lie down together. On the days that Otis takes a daytime nap I often nap with him, I might get a drink and read a magazine, read emails or tidy the house. After quiet time we usually move into one of our living areas and I will sit and read a book or play with Otis. This is the time Otis is most likely to do a PUZZLE or USE HIS MATERIALS. Sometimes I am reading Montessori other times not (often I'm browsing recipe books). I also take this time to think, daydream and plan. Occasionally if Otis is really absorbed in his activities I might prepare some materials. We pick Caspar up from school and we visit friends, go on an outing (zoo, museum, library etc) or go home. If we need to run errands (post office etc) we often do this on our way home from school. At home the children are free to do as they like. Usually they snack, play inside or outside. During this time I might tidy or start preparing dinner. After half an hour to an hour we might go on a nature walk. Once home from our walk it's time to finish preparing and eat dinner. After dinner the children play then it's bath, story-time and bed. Once the children are asleep I will again tidy, do some laundry, read, make or rotate materials, email frirends and catch up with you here on the blog. If I am going to invite Otis to a demonstration of a new art or practical life activity I will usually do this is the morning. If am going to invite Otis to a demonstration of a new material not art or practical life, I will usually do this in the afternoon, after lunch. Otis concentrates much better when Caspar is at school. Once Caspar is home Otis will play but it's usually outdoor play or playing with blocks together. Sometimes Caspar has speech pathology after school. Caspar plays sport on the weekends. We will also attend the markets, shop and go on outings on the weekends. I try extremely hard not to live a busy life. I try especially for Otis to spend as much time as possible at home. We don't live near school so the drive is lengthy for Otis. I also try extremely hard to stay organised but there are times, weeks when we spend too much time outside the house, the housework builds up and things get overwhelming. I find the more time we spend at home the more organised we are. The main thing missing from my days is time to exercise. I'm still working on that. I hope this answers all of your questions. I apologise this post was so long coming. P.S. You can now find us on Instagram. OK, there is only one entry, but it's a start! I first met Karla many years ago when I was looking for some suitable aprons for Caspar. I loved the aprons in her Etsy store so much that I bought more than one for our own home and started buying them for friends. I remember featuring Karla's daughter Ruby here and I eagerly awaited another opportunity to find out more about this Montessori family. If you are skimming this post please stop and watch the video of Ruby washing the dishes. Essential viewing for parents with toddlers! Can you tell us a little about yourself, your family, and where you live? I am a stay-at-home Montessori mom. I have my AMI Montessori Primary training for ages 3-6 and have started the AMI Assistants to Infancy training for birth to age 3. I discovered in my training that I have a passion for making Montessori materials. I sell my materials in my Etsy shop Handmade Montessori. I live in Austin, TX with my husband and our 2 1/2 year old daughter Ruby. We have a Montessori home and Ruby attends a Montessori toddler community. When and how did you become interested in the work of Montessori? I became interested in becoming a Montessori teacher when I was about to graduate from college with a degree in Computer Engineering. It was my last year of college and I had begun the process of looking for an engineering job. I was very unenthusiastic about the prospects and really had no clue what I wanted to be doing with my life. I went on vacation with my two younger cousins and had a blast hanging out with them. We talked about their troubles in their traditional school and I just knew in my gut that they were being treated with no respect for their emotional needs. That’s when I realized I wanted to work with children. I started remembering my own childhood experiences in Montessori school - I went to Montessori school through 8th grade. I hadn’t thought about my Montessori experience in years and had never really thought of it as being different or special. But the differences between my experience in Montessori school and my cousins’ experiences in traditional school were clear. I graduated college and worked as a Computer Engineer for two years. It was not a fulfilling career, so I went for it and took my Montessori Primary training. I worked as a Montessori teacher for 7 years at both private and public Montessori schools. How have you applied Montessori at home? When my husband and I decided to have a baby, I knew I wanted to know more about the Montessori approach for birth to age 3. So I started my Assistants to Infancy training. I took the first summer of training, which covers birth through the first year. I also worked as an assistant to a wonderful Montessori toddler teacher. I got to experience a beautiful community and see first-hand how very capable these young children are if you trust them and provide a beautiful environment with rich opportunities. We have modeled our home environment from what I have learned through all of my Montessori experience. Ruby has had a floor bed since birth, she has low shelves with interesting activities available to her at all times, and low tables and rugs for her to use independently. We try to set up everything we do so that she can be involved in some meaningful way. Here are a few videos of her participating in the care of our home. I also love creating Montessori materials for my daughter. The possibilities for Montessori activities are endless, but it can be very hard to find good materials. I make a lot of her toys myself, which allows me to really follow her interests. She loves dogs, for example, so I created this dog breed language set which has little plastic dog figures and a set of photos to match. She has learned the breed names of the 12 dogs in the set and it has inspired her to learn the dog breeds we come across in real life too! Ruby is still very young and her needs change frequently. Our home has been a constant work-in-progress since she was born. From infancy, to crawling, to walking, to potty training, to now there have been a lot of new developments and changing needs. Montessori is about creating an environment - physical, emotional, and spiritual - that meets your child’s needs wherever they are in their development. Its a lot of work to keep up with her, but definitely worth it to help her become a confident and capable young person. Are there any books, websites, blogs that you could recommend? Montessori From the Start by Paula Polk Lillard and Lynn Lillard Jessen is a wonderful book about Montessori from birth to age 3. Aid to Life is a great website with lots of information and videos for birth to age 3. Edison’s Day is a video of Montessori in the home. You can buy it here or ask your Montessori school if they have a copy to borrow. It is amazing to see all the ways a 20- month-old child can really be involved in and contribute in meaningful ways to the daily life of the family. Montessori on the Double, The Full Montessori, Feeding the Soil, Maria Montessori, Sew Liberated, Janet Lansbury and Carrie Contey. Handmade Montessori, Bella's Casa, Pinkhouse Handworks, Goose Designs and Beginning Montessori. Thank you Karla and her family for this wonderful interview. The video of Ruby washing the dishes and the matching dog set are just fabulous! P.S. If you think you spy Henry in the above photograph, I think you might be right. If you have children at a Montessori school have you ever wondered how they would adapt to a traditional school environment? Like many Montessori schools our school is primary only, it runs until the child is twelve and ready for high school. This means that at some stage my children will transition to another school. Today I had the pleasure of interviewing Leah. Leah is a fun filled twelve year old and is a recent graduate from Canberra Montessori School. She has just finished her first term at Canberra Girls Grammar. I wanted to ask her a few questions about her Montessori schooling and her transition to a traditional high school. How was your first term at Canberra Girls Grammar? The start of the term was hard as I didn’t have any friends. But then in the second week I found lots of friends and it was fun and it wasn’t that hard really. Do you have any favourite subjects? Sport and Maths. What is it about Sport that you like? Sport is just fun doing stuff and you don’t have to do any work. What is it about Maths that you like? I have a really good teacher and he’s really funny. What are the biggest differences you have noticed between Canberra Montessori and Girls Grammar? At Grammar there are a lot more people and there is more opportunity to do things. You have more facilities and it’s a bigger group so it’s really different. What is it that you have struggled with leaving Montessori and transitioning to high school? Not knowing anybody for the first week and then changing classes and getting homework. In which areas do you think you have excelled? Is there an area that you think you do better because of your Montessori schooling? In science I can answer a lot of questions that other kids can’t because at Montessori we do a lot of demonstrations with the teachers. Have any of your teachers commented about your learning style or how it is different from the other students? Not really but one teacher, since I work differently she thought that everyone went to the junior school and they didn’t. When I didn’t understand things she wondered why. How do you think your transition from Montessori to high school could have been improved? I think it would be better to have more tours of the school so you weren’t as lost walking around the school. I think it would have been better if we could have had a few more introductions to the school so we could have met more people at the school. Do you have any advice to students that are in a similar position, currently attending Montessori and transitioning to a traditional high school next year? It’s good to be really organised. It would be best to get a map of your school so you knew where to go and mark the spots where you need to go at the start and during the day. What do you miss from your old school? What are your greatest memories from Canberra Montessori? Well, what I miss about it is not having the freedom to do the work that you choose to do. My greatest memories are going on all the goings out that we could go on and organising them ourselves. What were some of your favourite places to visit? The zoo, six of us went and we split into two groups. My group went to the aquarium and looked at all the fish. Do you notice any differences between you and the other students that you can attribute to your Montessori schooling? Do you think you approach your work differently? Probably, in maths I do the fractions differently by drawing a pie and breaking it up into bits. Everyone else does it in another way. How have you found homework? I think homework is useless, when they give it to us we don’t really learn anything from doing it because when we hand it back in they don’t really mark it and tell us what we’ve done wrong with it, so we don’t know how to fix it if we’ve done it wrong. What does Montessori mean to you? When someone says Montessori what do you think of? What images come to mind? I think of the classroom and the teachers and all the different materials. If someone asked you what is Montessori – what would you say, how would you describe what Montessori is? It’s somewhere where we get to do the work that we choose to do. We don’t get recess or homework and we don’t have to wear a uniform. At Montessori I made lots of really, really good friends. Some of them I have been with for ten years. We also never had a canteen at Montessori - that would have been fun. You mentioned having to be more organised, have you had to organise your work differently? You have to be really organised. I have all these different folders for every subject, which is what most people have. But some people they don’t have folders and they just throw all their work into their lockers and it’s a lot harder for them to get ready for class as they can’t find their books and they can be late. So it’s better to have everything a lot more organised. You mentioned in science you have been able to answer some questions that the other student’s haven’t because you did some hand on experiments with the teachers, are there any in particular that stand out in your mind? God with No Hands. They read us a story about the solids, liquids and gases and about how the particles cling together in solids and how they just buzz around in gases and sort of flow in liquids, so I could answer questions about particles. Can you tell us about your recent Calisthenics competition? I came first in Graceful, which is sort of like ballet but without the point shoes. If I get in the top four at the next competition I can go to the nationals. Congratulations Leah, thank you for the interview and best wishes for Calisthenics and Term 2! If you think Leah looks familiar I interviewed her Dad here. I loved Leah's story about God with No Hands! If you are new to Montessori - look it up, it's one of Montessori's Five Great Lessons for the elementary years. I caught these candid shots of Otis tonight, attempting to put on an apron. It's his art apron which goes over the head then the straps come together with velcro at the front. He can put it on independently so I sat back and waited. He couldn't get it on so he took it off and threw it on the floor, then picked out another apron (the red one) and proceeded to put it on without so much trouble. You can see the blue apron lying on the floor in the background. Well, he got there eventually. I'm told way too often that there aren't any photographs of me on the blog. There are a few if you look hard enough. Here we are braving the elements for food, really good food. I have promised time and time again a post about our routine, about our schedule and how we fit Montessori (and housekeeping!) into our lives. I promise again that I will have a post on this soon. Congratulations to Kelsey and her family on the birth of beautiful Dashiell, if you missed my share on Facebook here is her wonderful Montessori inspired nursery. My very dear friend Charlotte has a new blog Montessori and the City. Charlotte is Montessori trained and has four children so this is worth a read! Thank you for your concern and your information on my newly found dairy intolerance. I'm taking it a day at a time and have found avoidance of cows milk the best solution. I'm still figuring it all out as a little cheese (in food) and goats milk is fine. My attempt at sourdough has totally failed, in our cooler weather I haven't been able to activate our culture. I will give it another go soon. My bread machine has also stopped working, if you have any recommendations on new models - please share. Many of you know that I have been parenting solo for many, many months now. I couldn't be happier that my husband who has been working overseas, returns this week. Parenting without him is by far the toughest thing I have ever done. It has been too difficult and too personal to share in this space but thank you to the many readers and friends who have supported us through this time. After some brief discussion with Neptune I realise that it's time for me to know a little more about Montessori Elementary. We will continue with Montessori schooling but it's true that I know very little about Cosmic Education. Where do I start? Please let me know if you have any blog or book recommendations. Also let me know if this is a topic of interest to you. Finally to anyone visiting Canberra for the Montessori Centenary Celebrations, please let me know, I'd love to arrange a get together! What to do with all those Puzzle Maps? From Caspar's earliest days at Montessori he loved Puzzle Maps. He would talk about Europe and working with friends on various puzzles. Then he started to bring home Puzzle Map artwork. First he brought home outlines of various states and countries. As time progressed he would bring home work with countries coloured in and with the oceans painted with water colour. Next labels began to appear and map by map his handwriting improved. We have the map of the world framed and hanging on the wall but what to do with the others? We had over twelve pieces rolled up and stored in a box, they were starting to look a bit tattered. I found this large art portfolio and it was the perfect solution. Each Puzzle Map piece fits into a plastic pocket. You can see Otis's hand below for an idea of the scale. Not only a lovely way to preserve this work but it's perfect to leave out and show the Grandparents. This work is great for their hand control, tracing around the outside of the puzzle pieces and all that colouring in. It's also a great geography lesson! Does your child love Puzzle Maps? I'd love to hear what you do with all their artwork. I know many people scan children's artwork but I feel like they put so much effort into this work I couldn't throw it away. Peeling and segmenting a mandarin fruit. After being shown this by his teacher Otis has been asking to do it at home. Cutting cheese with a cleaver. The cleaver isn't very sharp, sharp enough to cut the cheese with pressure. Our slicer is being used for everything; eggs, strawberries, cheese and mushrooms! The mushrooms need to be fresh and placed this way up, otherwise they are too tough to cut through. Mixing. You can see what Caspar and Otis are making here. School holidays = more kitchen fun! Over the weekend the boys explored charcoal as a new art medium. I wasn't sure about young children using charcoal until I read this article. Varying the depth of colour, smudging, shading, better for the children's fine motor skills - I was sold. The safety precautions are the same as chalk, not in the mouth and don't blow (or inhale) the dust. We took this activity outside. It wasn't very messy at all. The children only needed to wash their hands and wipe the table down afterwards. Later we put the paper on clipboards so the boys could move around with their art. It's a nice contrast to our usual painting. Have you used charcoal before? I really enjoyed it. The charcoal goes onto the paper really smooth - it's fun and easy to use. Our strawberry crop is still going strong. This activity reminds me of this day. Child of the World - Montessori, Global Education for Age 3-12+. If you are wondering why you haven't seen this book before it's because it's a new release. Published in 2013 I suggest this is already a Montessori classic. Books of this calibre don't come along very often. I ordered it immediately knowing Susan's other publications The Joyful Child and Child of the World (Michael Olaf's Essential Montessori Series). This book is essential for all Montessori school and parent education libraries. Even for those well versed in Montessori this is a must read because it contains so much of Susan's personal experiences (from around the world) and her valuable insight. Child of the World is divided into four parts; Age 3-6, Age 6-12, Age 0-24 (Stages of Development) and Parents and Teachers. I found Part One, Age 3-6 the most valuable. It contains so much practical information for school and home. I love this section and I took pages of notes. I particularly appreciate the information on selecting toys, activity suggestions and the discussion on screen time. Part Two, Age 6-12 is less about what to do at home and more about the 6-12 Montessori school environment. I found this very useful as the mother of a five year old and knowing very little about the next cycle. If you have a child in or approaching 6-12, at a Montessori school, this section is extremely valuable. I felt a little lost in Part Three. This section contains Montessori theory about the stages of development. It was so refreshing to read about Montessori adolescence and even adulthood, so rarely mentioned in other texts. Perhaps I'll be more engaged when my own children near this age. Part Four, Parents and Teachers is too brief. This section provides some background to Montessori education, covers the basics and it a nice way to finish what is an excellent resource. Child of the World is perfect for all parents including those new to Montessori, although it is quite different (in a good way) from existing books. It's not at all prescriptive but if you read the entire book you will have all the information needed to create a Montessori home environment. I would recommend this book to parents of children from the toddler years up. It is a strength of this book that it covers such a wide age range. After reading Child of the World I have fresh ideas and am inspired to make changes to our home! Those pages of notes I mentioned, I thought I'd share some of them with you! Practical life is so important. Practical tasks help lay the foundation for all later mental and physical work... When a child has a lot of experience with the important developmental tasks called practical life he becomes more successful in all other areas of study in relation to others. Pg 12 & 13. Mothers and parents need not be perfect! We must be easy on ourselves in the home and plan a time when we will enjoy the work as well as the children. Begin with just one thing, perhaps putting the napkins on the table for a meal, and gradually add to the takes in which the child can participate, and eventually take over. Pg 14. It all starts in the kitchen! Cooking and eating are something everyone does every day. Perhaps taking a few moments to work together to cook something, to set the table, just one little thing each day, can keep the whole family on the path to wholeness. Pg 16. Screen time! It takes work on the part of the adult to withstand the temptation to let the child spend hours in front of the television, the computer or other screens, but it is worth the effort to support the natural development of the child. Pg 18. Blocks! In our experience, next to doing real family work, playing with blocks has been one of the most valuable toys for a young child at home. Pg 24. World Globe. A globe is probably one of the most important pieces of material to have in the home. Pg 31. Demonstrate in silence first, a child cannot both listen and watch. ...try to refrain from talking while you are demonstrating an action, and refrain from demonstrating an action while you are speaking. Pg 35. Books. ... simple picture books, beginning reading books but also advanced reference books. Pg47. ...a flag book. Pg 53. Art materials. Children benefit from having a variety of art materials available to them at all times and a space to work, uninterrupted, when they are inspired...pencils, crayons, felt pens, clay, paper, and brushes. Pg 59. What Montessori is about. When the environment, including the adults, give children from conception all they need, physically, emotionally, even the very young will be able to use their own internal wisdom to fulfill their needs and develop their fullest potential. Pg 122. We do not believe in pushing the child, but we believe strongly in providing an environment rich in all areas of learning so that the child can choose, from his own intuition, what he is ready to learn. Pg 27. What to look for in a classroom. Montessori classrooms should not look like they are bought in bulk from a factory. They should be inspired, individually created, and cherished by children and teacher alike. Pg 140. The home environment - the basics. There are two important things to keep in mind in organizing a child's environment in the home. First, have a place in each room for the few, carefully chosen child's belongings...Secondly, don't put out too many toys and books at one time. Pg 142. Be selective! Many parents and teachers find themselves tempted to purchase more materials than are needed... This is not only wasteful, but damaging to the child's development. Pg 145. Inspiration. Through our children, we parents and teachers are the architects of the future of humanity. Pg 146. Child of the World is a complete resource for Montessori in the home for ages three and up. Expecting a baby? Having a baby shower? Attending a baby shower? 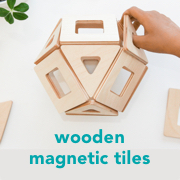 Here are a few Montessori-ish baby gift ideas. This post contains some affiliate links. Baby Carrier. I love the Ergo. You may want to consider the infant insert also, essential for carrying a new born. Understanding the Human Being. A great Montessori book for pregnancy through to the first year. The best price I have found is via NAMTA. Topponcino and cover. This is one item I wish I knew about before I had my children. If I had anther baby this would be one of the first items I would buy. 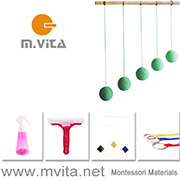 Montessori mobiles. This is a Bell on a Ribbon. Baby Hair Brush. This one has a waxed beech handle with soft goat hair bristles. Bodysuits that open at the front. Baby Blankets, wraps and wipes. Nursing Necklace. A beautiful gift! Books. Because newborns like a story too. Munari Mobile. Find one online or make your own. Image from Montessori in Motion. First Chair, we love the Me-Do-It Chair. Learning Tower. If you have a small kitchen consider the Fun Pod. What a fun list to compile! I love shopping for babies!! I would love to hear your suggestions. What do you like to give at baby showers? Edited to add that all links should be working now! Pasting is usually on our art shelves. Otis hasn't been choosing the activity so I reassessed the pasting tray and made a few changes. First I switched from a medium sized tray to a small tray. I feel Otis is more comfortable carrying the smaller trays especially when they are heavy. His pasting tray had a large glass jar for paste. He couldn't independently open the jar (which is what I wanted at the time) and the jar was heavy. I switched the paste to a small jar with a screw top lid which he can open independently. He cannot fully and tightly close the lid but that's ok. The tray had large coloured randomly cut out shapes for pasting. I replaced them with smaller flying insect images. As it happens whenever you update a tray - it interests the child immediately. A change, an update, a reassessment is good! Today we gathered with some of our dearest friends to celebrate Otis's second birthday. There was magic and balloons. This guy is fabulous! Otis's favourite part was the cake. This is our first party since we've committed to wholefoods. I think we did ok. Happy birthday Otis. We love you. More photographs at photo of the day.